With it finally starting to get cooler in Alabama, it is now seasonally and temperately appropriate for me to be burning all kinds of candles in my apartment. I definitely go through my candles with the seasons; I love burning the fresher scents in the spring and summer and my warmer and cozy scents in the fall and winter. That being said, I wanted to share my top 5 favorite winter candles this year that I've been loving. "A familiar, welcoming seasonal blend of cinnamon, cloves, pine, cedar, smoked firewood and vanilla." Now, I know I put the counterpart to this candle in my fall candle favorites, and in all honesty, the only difference that I can tell between the two is the color. The fall one is a pinky-mauve, and this one is obviously a deep forest green. I just love having this one on a table during the holiday season because it's so festive looking. As far as scent goes though, I'm pretty sure it's exactly the same. and a special blend of cinnamon and clove highlighted by sprightly bergamot." This is my favorite Bath & Body Works Candle of the Christmas collection. It is very cinnamon-y (as the description states), and it basically reminds me of a red version with a more festive picture of White Barn's 'Spice'. It is the perfect warm-and-cozy candle for the holiday season, and I'll be burning this one all winter. "Sweeten up your home! Inspired by bright moonlight and a distant fire on a crisp, winter night, this lively fragrance unites fir tree, warm cypress & clove bud as they blend perfectly with cedar & a touch of incense." This is the most unique candle I've ever owned and I've actually purchased it two winters in a row. The best way I can describe it is what my backyard in Michigan would smell like at night after it had just snowed. There is a crispness to it, even though it does have some clove in it. It's probably not a scent for everyone, but I definitely recommend checking it out the next time you're in Bath and Body Works. 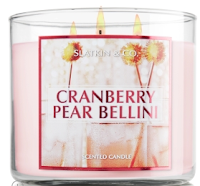 "Cheers the holidays with a bright blend of sparkling cranberry, sweet pear nectar and luscious blackcurrant." I thought this candle was discontinued (I'm not entirely sure why I thought this), so when I saw a bunch of mini ones at a Bath and Body Works outlet, I bought like, 8 of them. But lo and behold, it was back this holiday season and I love it. 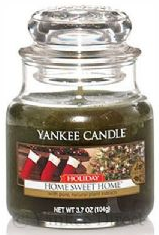 It's a very light, fruity scent, which is a good change of pace from the heavier holiday scents. However, it still fits right in with the season because you can actually smell the "sparkling" part of the scent, if that makes any sense at all. 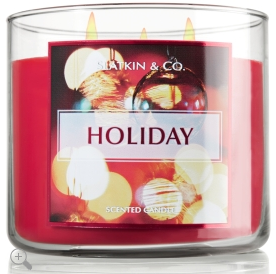 I think this candle is a great year-round candle, but I'm including it in this round of top 5 because it's produced as a holiday candle. spiced plum infused with mulled cider and tart cranberry." 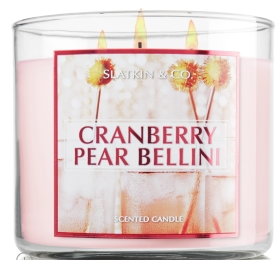 This candle is the only one I've never owned a large 3-wick candle of, but that's because every Bath and Body Works I've been at this season has been completely sold out of it. So I had to settle for the medium-sized single-wick candle, which I still love. This candle reminds me of a winter version of the cult-classic Leaves candle by B&BW. I think they must have similar notes of berry and apple in them, but I can't be sure. 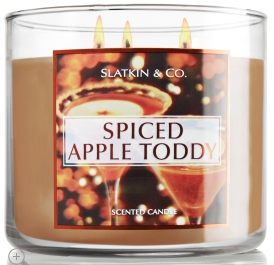 Either way, if you're on the hunt for a replacement for your fall Leaves candle, this is a great winter alternative. 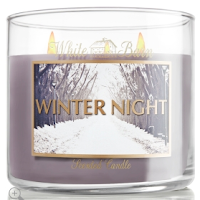 That rounds out my top 5 winter candles! What are your favorites that I should check out? Let me know!